Home > History	> Another Overwhelming Evidence Argument? Stephen Jones has just about wrapped up one of his drawn out, serialized postings (he is nine tenths of the way done, he tells us) that are part of his overwhelming evidence drumbeat. Perhaps I should have waited a couple more days for him to finish the posting. But he was drifting away from the main thrust of his argument. Because he had moved from discussing the cloth’s selvedge into a rehash of his outlandish and obsessive conspiracy theory that the carbon dating results for the Shroud of Turin were manipulated by a computer hacker who was probably working for the then Soviet KGB, I concluded that his posting was finished. His posting is out there on his blog and finished as far as I was concerned. Problem for the forgery theory. This is yet another part of the problem for the forgery theory, that the Shroud is not medieval (see #1,#3, #4, #5). 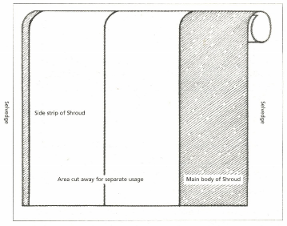 As we saw above, the two selvedges running down the lengthwise borders of the Shroud prove beyond reasonable doubt that: 1) and the main body of the Shroud and the sidestrip were evidently cut lengthwise from a larger cloth and then joined to form a composite cloth which became the Shroud, with the combined dimensions of 8 x 2 Assyrian standard cubits (see also Dimensions #3); 2) the cloth that the Shroud and sidestrip were cut from had evidently been woven on a wide loom, which existed in the Roman Period but not in the Middle Ages; 3) the sophisticated weaving and tailoring of the Shroud points to it having been manufactured in a textile `factory‘ which are known from Roman period Egypt and Syria but not from the Middle Ages; and 4)the unusual stitching, binding and finishing of the selvedges is, like the stitching of the seam joining the sidestrip to the main body of the Shroud (see Sidestrip #5), known only from the first century Jewish fortress of Masada. So the shroud could not possibly be medieval? But aren’t 1, 2, 3 and 4 debatable? The graphic above, and much of Stephen’s argument concerning the selvedge, looms of 11′-6″ width during the Roman period, etc are almost a direct uptake from Ian Wilson’s 2010 book. Wilson cites as his authority a Flury-Lemberg article which she published in ‘Sindone’, new series no.16, December 2001, p.58. It is claimed that Egyptian looms of this width were known, and were required for the then much-prized fashionable seamless tunic. Complex weaves from this period are certainly known, but more often in fabrics other than linen. A counter-argument might be that the three-pedal loom required for the most efficient production of the herring-bone twill seems to have been a later invention. My own view is that in view of the extensive trade within the empire and beyond, together with far-flung military garrisons, it is not necessary to presume a Middle Eastern provenance for a product such as the Shroud cloth emerging in 1st century Jerusalem. I have no knowledge of cloth/fabric etc. except that I wear them, cotton tee shirt etc. (I guess I like the abbrev. etc.) All in all what grabbed my attention are the wrist wounds and then when I was looking at the eyes in the photos trying to see the coins that folks are talking about and all I could see was the possibility of one of the eyes open so that one pupil was visible and then something seemed to grab me in the inside of my head and I heard the voice of my Guardian Angel tell me that I was seeing the image of the living Jesus Christ. I had heard my Guardian Angel before in my life, 1st time was When as a kid and drowning in a lake and I knew I was in trouble looking up in the water and seeing the surface above me but not able to do anything to pull myself up there. He told me to say my prayers because I was going to die. I was confused as I understood the words, didn’t know where they came from but I knew I was in serious trouble and I knew a couple of prayers but not sure which one to say and he started saying the ‘Lord’s Prayer’ or as some call it the ‘Our Father’ so I continued to say it in my mind then I saw something that looked like pinkish or reddish or ?? colored clouds and had what is now called an NDE. The I remember being told that this is all I will remember and I see what looked like a movie of me being mad at a friend and hitting him, then I saw the field next to our home that was in a different state but we were on vacation in Indiana. Next thing I know is I’m laying on a beach towel on my stomach, my head on my arm and the towel under my head and on my hand is wet with water and snot (mucus), I was alive. My older brother had swam out and pulled me out of the lake and did CPR on me . The next time was when I was nearing my tour in the Marines and I was considering re-enlisting as I had been told a couple of times by Sergeants that I would be promoted to Sergeant when I shipped over (re-enlisted), my Guardian Angel told me on 2 occasions a few days apart not to re-enlist but I just kind of ignored him. Then one day when my enlistment was due to end, I was reminded by one of the senior Sergeants that I had better get upstairs to the personnel office and tell them I was ready to re-enlist. The Sergeant walked away and I started to walk to the door out of the office I was in to go upstairs and in a loud voice inside my head I heard “DO NOT RE-ENLIST” I did not re-enlist, I got the message. This was in mid February 1964. Does Viet-Nam ring a bell. I learned to pay attention to that seldom heard voice. 1) The side strip appears to have originally been part of the Shroud, cut off and resewn. 2) This could have been because a strip from within the sheet was taken out, and the edges resewn together, in order for the finished cloth to have a selvedge on each side. 3) The cloth could have been woven on a 3m loom, and a strip about 2m wide removed. 4) The ancient Egyptians had looms 3m wide, and medieval weavers didn’t. 5) This proves that the Shroud is authentic. Apart from No.1, none of these statements bears any scrutiny, and the conclusion is tenuous in the extreme. As usual, Stephen relies almost exclusively on secondary sources, so it is difficult to track down the truth of any of his references, but here we go. Point 2. With the greatest respect to Mme Flury-Lemberg, I do not go along with the selvedge argument at all. The ancient Egyptians, 1st century Palestinians, and medieval weavers were quite capable of producing cloths of various widths, with selvedges both sides. If you wanted a 110cm width of cloth, you made a 110cm width of cloth, you didn’t get a 3m width of cloth and cut a strip off it or out of it. The only reason for such an action would be if you wanted a 110cm strip of cloth, and the only one available was a 3m wide one. However, if this was the case, you’d be in a hurry, and surely not bothered about matching the selvedges, especially if it meant putting in an ugly seam all the way down the cloth. You would cut the cloth to the required width and hem the edge, so there was no ugly seam down the length of the cloth. This would be more attractive to look at and easier to do, than cutting out a strip and resewing the edges, giving you the seam down the middle. Furthermore, all you would need to do to the remaining cloth would be to hem the single cut edge, rather than having to hem both cut edges as in Flury-Lemberg’s scenario. I’m afraid I think her idea very far-fetched, and would need evidence that it was a common practice, or even a rare one, before I gave it credence. Points 3 and 4. Even if the strip removal thing were granted, the cloth from which it was removed was not necessarily originally 3m wide with 1.9m removed. It could have been 2m wide and a 90cm strip removed. Although I do not know about how wide medieval looms could be, they certainly had them at least 2m wide. Viking looms are described as “typically” 2m wide. Point 5. The fact that the Shroud could possibly have been woven originally 3m wide, had a 10cm strip, followed by a 190cm strip cut off, and then the 10cm strip sewn back on, does not mean that this scenario is at all likely, let alone proof of anything. While we’re at it, few of the rest of Stephen’s facts bear much scrutiny either. The dimensions of the Shroud equate to “8 x 2 Assyrian cubits, the standard unit of measurement in Jesus’ time, even among the Jews.” There is no evidence for this at all, and some to the contrary. “The reason for such wide looms was to produce the tunica inconsutilis, or seamless tunic, which was particularly fashionable in the Roman period.” I do not know about Roman fashions, but unless a tunic is woven as a tube, or consists of nothing more than a long thin sheet with a hole in it, it has to have at least one seam to hold the sides, or one side, together. If, as I suspect, the word seamless means that it was woven from just one piece of cloth (which may have had seams at the sides), then a strip about 14 ft long and 3 ft wide would be about right, but this would not be a 3 ft length cut from a piece of material 17 ft wide, it would be a 14 ft length cut from a piece of cloth 3 ft wide. I do not think the wide Egyptian loom had anything to do with the Roman tunica inconsutilis. Is there any evidence for this? “The unusual stitching, binding and finishing of the selvedges is, like the stitching of the seam joining the sidestrip to the main body of the Shroud, known only from the first century Jewish fortress of Masada.” This statement is a familiar misinterpretation of Flury-Lemberg’s opinion that the stitching at Masada means that the Shroud could have been contemporaneous, not that the stitching is not known anywhere else, or that it must have been. of “procedural debate of court”. analyses you can hope to win. not appear in the popular book by Professor Fanti]). I try to change our perspective. What is your idea on that argument? Is it possible to know more on that question? We can start from the observation on a modern cutting. Here what I have found now: the “wimpel”. by Jews of Germanic (Yekke) origin. Is that cloth an adequate analogy for the strip? would remain there until the next reading when it would be removed and remain in the synagogue’s collection. Some synagogues still maintain a wimpel collection. Re cutting from wider bolt of cloth: An argument mentioned by Wilson, possibly from Flury-Lemberg, is that it did not require a great deal more labour to weave a cloth 3.0 m wide than one of only 1.0 m wide, only more yarn. If a loom of say 3 m wide were available in the factory workshop, it would make sense to exploit its complete width for cloth production, and then cut the full bolt of cloth to obtain the individual standard commercial products, instead of having perhaps three separate set-ups. There must be a reason why the edge piece was sewn on, and the provision of a finished selvedge makes reasonable sense. Of course, Wilson also has another explanation, that it was a deliberate intention to centralise the facial image to conceal the cloth’s true identity as a burial cloth so as to produce a Mandylion type of presentation. Of the two explanations, provision of a selvedge seems to me the more likely and credible reason. I agree that the strip is a real mystery, but still think cutting the cloth in two and hemming the cut edges is so much more sensible, and elegant, than having a seam down the cloth, that I don’t think that would have happened. Perhaps, just as the weave is apparently unique, the seam is unique as well. I could agree that a hem would seem to be quite a reasonable and acceptable solution if the cloth had been cut from a wider bolt, Raes found some differences between the two pieces, but this might only because the selvedge was taken distant from the main cloth. So why wasn’t it hemmed? Does this take us back to Wilson’s idea of centralising the facial image, and concealing its identity as a burial cloth by folding? Shades of tetradiplon! But I still consider it unlikely to have been the Mandylion. But it might have been the template for it. “…there is no evidence of any looms to weave 3/1twills in linen of th 1st C. – or examples of regular or herringbone twills 3/1 in any linens before the 7th C. AD. And we dont’ have to cite any further timeframe for such herringbone twills in linen, until the 14th-mid-18th C. in European countries. Those are products of the treadle loom of four shafts with pedals, which is an advance loom of the Early to Late Renaissance–only in European linens, 15 of them. Correction on date of death: the date in the main text of Mrs. Donnelly’s letter says 1988, but the date at the top of the letter is from 1998, so the latter is the correct death year. In the interview “Professor Giulio Fanti discusses the controversies in the realm of Shroud studies” on http://academia. edu it is stated that work is being done on what is possibly a 13th-century patch going beyond the site from where the 1988 sample was cut. Thank you Joe, Yes I found his newspaper clipping that he passed away in 1998. His work is so extensive and one day I’ll archive them for the web site. Donnelly’s assessment is very much in line with what recent ancient textile experts tell me- the Shroud is the typical work of a medieval treadle loom. The 113cm is a pretty standard width, compare the six linen strips of the Zittau Veil, another treadle loom product, which average just this,6. 80 m in total. When time permits I’ll publish Donnelly’s work on the HSG site. No doubt, he has done a great deal of research and has sited well over 100 books to formulate his hypothesis. So a medieval artisan goes to great lengths to create this relic using a medium that, to date, has not been replicated — yet uses a very common, locally sourced linen? Kind of like making a counterfeit painting of the Mona Lisa but using modern canvas. Very odd. Mr. Donnelly wrote about a “miracle duplication of the actual True Sindon, 33 AD”. I heard this suggestion from my professor of parapsychology years ago but found it unlikely. A lot more research on ancient textiles will be needed. “ll segno del soprannaturale” (= “The sign of the supernatural”, a magazine printed in Udine).